Home » Personal Finance » Real Estate and Housing » Is a 15-Year Mortgage a Good Idea? You're ready to buy a home, and it's time to choose a mortgage. Mortgage loans come in a wide variety of options, including everything from a standard 30-year, fixed-rate mortgage, to loans with interest rates that adjust every year. Then there's the 15-year, fixed-rate mortgage. It comes with an interest rate that doesn't change and is lower than the one you'd get with a 30-year loan. But because this loan has a shorter term, it also comes with a higher monthly payment. Should you consider a 15-year, fixed-rate home loan? Maybe. There are pros and cons to this type of mortgage. Let's first look at some of the upsides to a shorter-term mortgage loan. Say you take out a mortgage loan for $200,000. If you take out this loan as a 30-year, fixed-rate mortgage with an interest rate of 4.10 percent, you'll pay more than $140,000 in interest if you take the full three decades to pay off your loan. Say, instead, you take out that $200,000 as a 15-year, fixed-rate loan with an interest rate of 3.25 percent. You'd pay just under $53,000 in interest if you paid off this mortgage over its full term. That's a savings of about $87,000 in interest. You pay less in interest on a 15-year, fixed-rate loan for two reasons. First, because the loan is paid back in half the time, you pay off a greater amount of its principal balance with each monthly payment. Secondly, 15-year loans come with lower interest rates than 30-year versions because you aren't holding the bank's money for as long. According to the Freddie Mac Primary Mortgage Market Survey, the average interest rate on a 30-year, fixed-rate loan stood at 3.78 percent as of September 2017. The survey showed the average rate on a 15-year, fixed-rate loan was 3.08 percent during the same time frame. If nabbing the lowest possible interest rate is important to you, a 15-year, fixed-rate mortgage is a good choice. 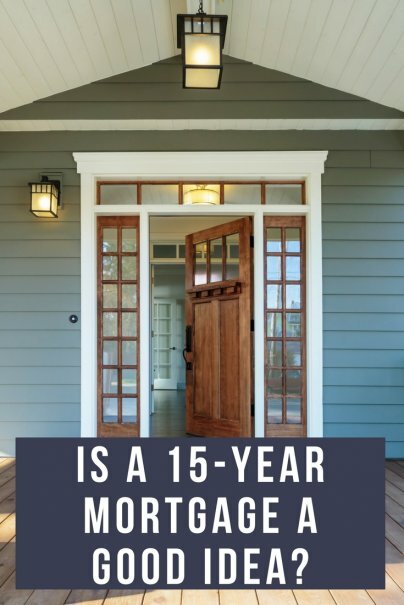 Because the term is cut in half, you'll pay off your mortgage faster if you go with the 15-year version. Once you've paid off your mortgage loan, you'll be able to spend or invest the dollars that once went to your lender. Just be aware that many homeowners never pay off their loans in full. You might refinance your 15-year loan to another type long before you pay it off. Or you might sell your home and move before you reach the end of your term. Here are the downsides to a shorter-term mortgage. Because you pay off a 15-year mortgage in half the time as you would a 30-year version, your monthly payments will be higher. How much higher? If you take out a $200,000 30-year, fixed-rate mortgage with an interest rate of 4.10 percent, your monthly payment, not including property taxes and homeowners insurance, would be about $966. If you take out that same $200,000 in the form of a 15-year, fixed-rate loan with an interest rate of 3.25 percent, your monthly payment would be about $1,400, again not including property taxes and insurance. That's a big difference. Yes, it might sound good to eliminate all the extra interest payments that come with a 30-year loan. But if you'll struggle to make the monthly payments that come with a 15-year loan, the shorter-term mortgage is not a good move. If you're worried about the higher monthly payments of a 15-year mortgage, but also concerned about paying too much interest over the life of your loan, you can take out a 30-year, fixed-rate mortgage and pay a bit extra toward your loan's principal balance every month. Doing this often enough will put a dent in the amount of interest you pay. And if there's a tighter month in which you don't have as much extra money, you can simply make your required mortgage payment without sending along a bit of extra cash toward principal. However, if you take out a 15-year mortgage, you must make the higher mortgage payment each month. You don't have the option of paying less. If your budget is already tight, or if you're struggling with high amounts of other debt, the smaller payments of a 30-year loan might make more sense.